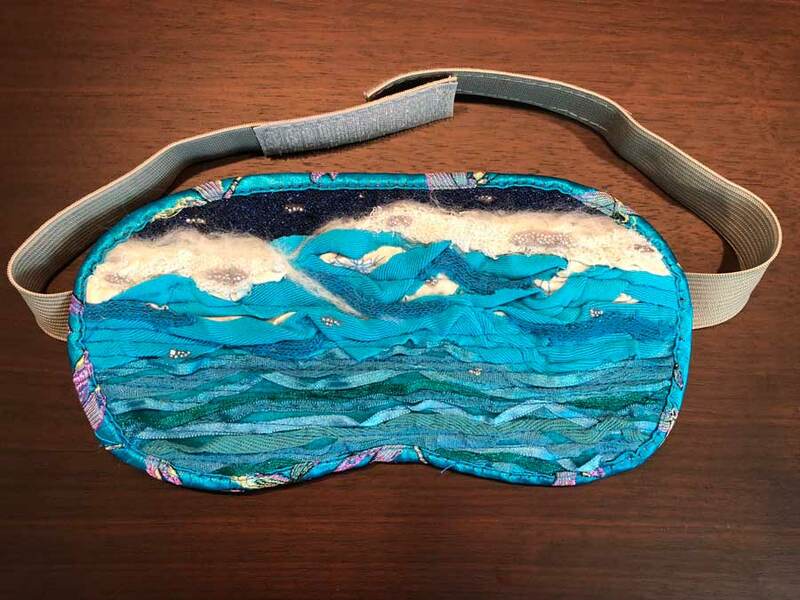 A creative fibre art project using repurposed fabric scraps & ribbons, and a sleep mask left over from globe trotting. At the beginning of August I was inspired by our new empress, Heidi. She published the sweetest painting she created with her daughter of a young girl surfing. The the rich colours combined with the texture and expression of the brush strokes made me so happy, I used it as inspiration to do my own creative project–made entirely of fabric. My canvas became one of the old sleep masks I have laying around from travelling the world by plane. I scrounged around for blues in fabric and random scraps of ribbons I’ve been saving for a project like this. My first I idea was to do the waves and simultaneously show an undersea view but as I progressed, layering fabrics and ribbons, I discovered I loved the texture too much to cover it up. In that manner, I went with the flow and worked on deepening the texture of the waves. I used nearly all of my pins to keep the pieces in place, so much so, that when I showed my husband what I’d been up to he asked, “Are the pins a part of it?” LOL, eye roll, eye roll. I looked up some techniques for quilting and found some ways of handling the bulky bits of fabric. Sewing would prove to be a challenge even with a machine. I made it through with lots of patience, slow and steady like the tortoise. 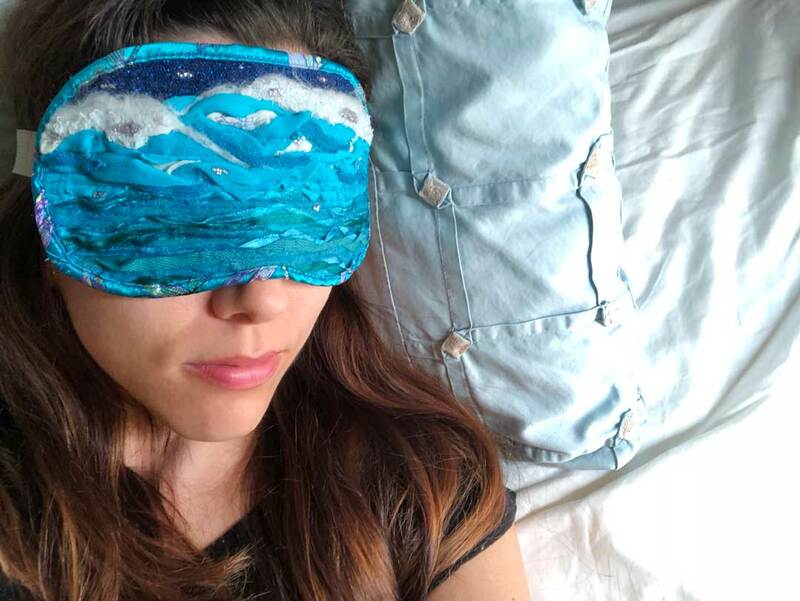 The thing I find about projects like this fibre art sleep mask, is they sneakily take longer than you expect. I’m started to wonder if it has more to do with my issues of striving for perfection than the actual creative project. Perhaps my next project should be really, really, messy. Until then, what dreams or scenes would you create for yours?